We carry a full line of purse and tote patterns designed by Laura Martell, as well as the hardware, webbing, and zippers needed to make them. 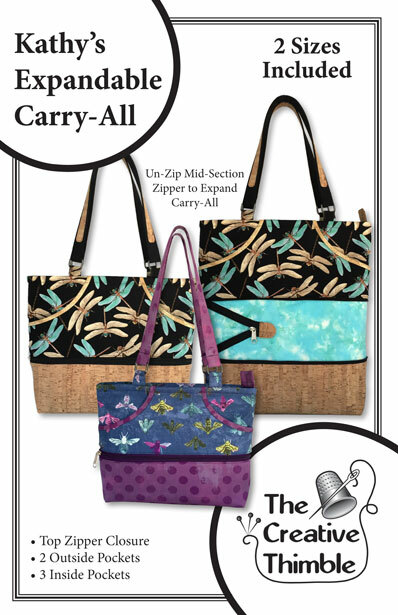 Check out our newest pattern: Kathy’s Expandable Carry-All! “I have been meaning to send you a message about both the regular Professional Tote and Mini Professional Tote patterns. I teach many bag classes at our local quilt shop in Prescott Valley AZ. In fact, I am know as the Bag Lady! I want to tell you that without a doubt your patterns are the best that I have taught! They are not the simplest by any means, but they are so well written, the illustrations are clear and I simply love the sheet of cutting labels. I have taught the regular Professional Tote 3 times and the Mini once and in all of the classes every student went home with a finished bag. No UFOs! Even the beginner sewers were able to complete it. Thank you for taking the time to make sure that your patterns are correct. I look forward to seeing new projects!” Joan C.
“The tote is done and I wanted to tell you how very much I enjoyed making it. Your instructions were marvelous. I am sending you pictures…I just wanted you to see how beautifully it turned out.” Janet J. “Laura’s patterns have great instructions! I have made dozens of tote bags, but when I need a quick bag to give as a gift, I always come back to Laura’s Tote. All of “Laura’s patterns have clear instructions, and are easy to follow. I recommend Laura’s patterns to all of my friends who are looking for tote bag patterns.” Lori R.